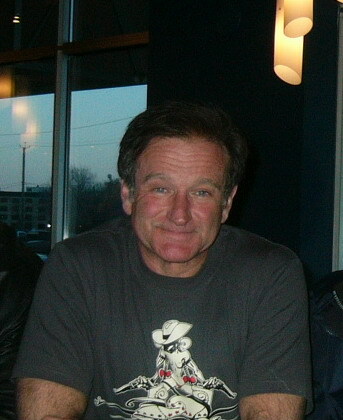 When I first heard that Robin Williams had died, it gave me pause. My world now is Harry the Bunny and Super Why! so I had to search my memory banks to attach the name to the face. Oh. Then when I heard that he had committed suicide, it was like someone kicked me directly in the stomach. OH. I have struggled with a bipolar disorder my whole life. Back when I was diagnosed it was still “manic depression” and the treatment was therapy and some little pink pills that made the highs lower and the lows more manageable. I was diagnosed because of a suicide attempt. When you are depressed, when you have been suicidal, any whisper of suicide can be a trigger. Now here was this huge mega star and he had done it: succeeded, crossed over, broken free. When you are suicidal, you see that and you think “Wow, he’s so lucky. He doesn’t have to suffer anymore.” Because when you are depressed, when you are suicidal, sometimes it seems like that is the only way out. And you start to think things like: Look at him, how adored he is in death. Maybe I could be just as adored, finally. (and that shadow in your brain laughs at you and says “Come on now, no one would even notice if you were gone.”) It’s like someone flips on the switch that makes you wonder if you should try again. It has been 20 years since my suicide attempt. During my recovery I promised myself that I would NEVER EVER let that happen again. I would never again get that close. I would never again let the darkness consume me. I promised myself I would reach out instead of folding into myself. In the ensuing 20 years life has been by turns horrible and amazing. Right now, things are going really, really well for me. I look back at that deep, intensely depressed time in my life and I am so thankful I came out the other side. I would have missed out on so many things, but most especially this incredible two year old daughter of mine. I have heard people say that Robin Williams was a coward, that taking his own life was a cowardly act of selfishness. Suicide is NOT an act of cowardice or selfishness, it is an act of desperation from someone who has fought every day of his life to hang on and just simply cannot do it anymore. Robin Williams was a fighter. I am, too. I am a fighter. Though I made that promise to myself two decades ago, it doesn’t mean I’ve ever quit fighting. That little voice sometimes tries to convince me that the world would be better off without me. I can’t say things like “I wish I was dead” or “I want to just kill myself” in that offhand way some people do. I don’t wish I was dead. I would not just kill myself. Some days those are easy things to remember, and some days they are really hard. I won’t do it. I’ll die one day, but if I am lucky I will be incredibly old, surrounded by grandchildren, and I will just slip away in the most unremarkable way. Until that day, I’m going to keep on fighting. Suicide can affect anyone…my personal account.